MakerWare 2.2.0 is now available for download. This powerful software is your go-to tool for translating 3D designs to printed objects, and an integral part of the MakerBot 3D Ecosystem. Here is a behind-the-scenes look at the major improvements we’ve made to the MakerBot Slicer, our slicing engine, with this release. We have improved support material for objects with overhangs. We have all new rafts that are easy to detach. We have better handling of narrow features, new infill patterns (cats included), and so much more. Let’s dive in: IMPROVED SUPPORT Meet Laurana, a 3D printed version of a bust by Italian Renaissance sculptor Francesco Laurana. In the pictures that follow, you’ll see support structures generated using the old version of the MakerWare 2.1.0 (left), and how this has been improved in the new release, MakerWare 2.2.0(right). Support structures are extruded materials that MakerWare can add to a 3D model in order to reinforce objects with overhangs. For example, Laurana’s Romanesque nose would droop under its own weight without support material. The new version of MakerWare is much smarter about generating supports only where they are needed. We’ve also changed the pattern of support material, so it’s much easier to break away. Objects use less plastic and print faster than ever. IMPROVED RAFTS We’ve also equipped MakerWare 2.2.0 with improved rafts. A raft is a thin foundation of extruded material that helps your object stick to the build plate during a print, keeping it level and secure. 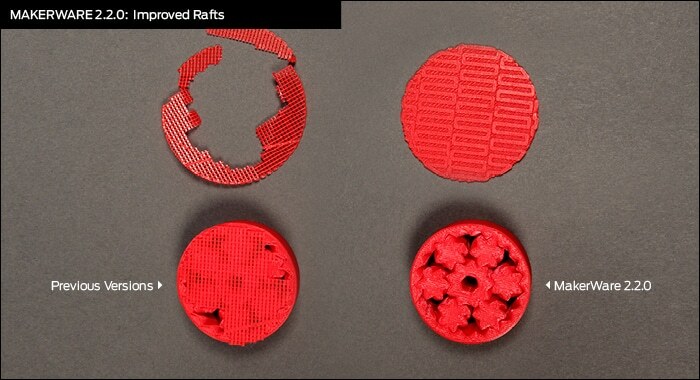 Our new rafts detach more easily, creating a smoother bottom surface. We printed a gear bearing to show how well our new rafts print on objects with detailed first layers. IMPROVED NARROW FEATURE HANDLING Previous versions of MakerWare occasionally missed details on thin or narrow features. Not anymore: MakerWare 2.2.0 offers the best handling of narrow features. 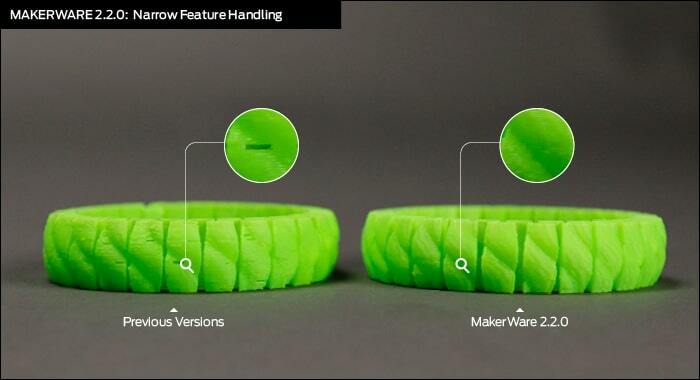 Below, you can see how the new version of MakerWare seamlessly printed a single-walled bracelet. NEXT WEEK: NEW INFILL PATTERNS AND MORE We’ll be highlighting additional new features from MakerWare 2.2.0 next week, including new infill patterns like the “catfill” pattern featured in the picture below. 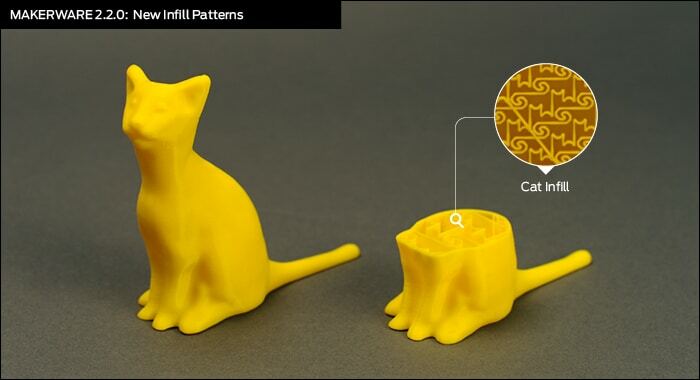 In order to turn on cat-shaped infill, just create a custom MakerBot Slicer profile and change the “sparseInfillPattern” setting from “hexagonal” to “catfill”. We’ve also released Firmware 7.3.0 today. It contains a few improvements and bug fixes, including an automatic pause for changing filament colors during a print. Stay tuned for updates, and be sure to download the full release today. 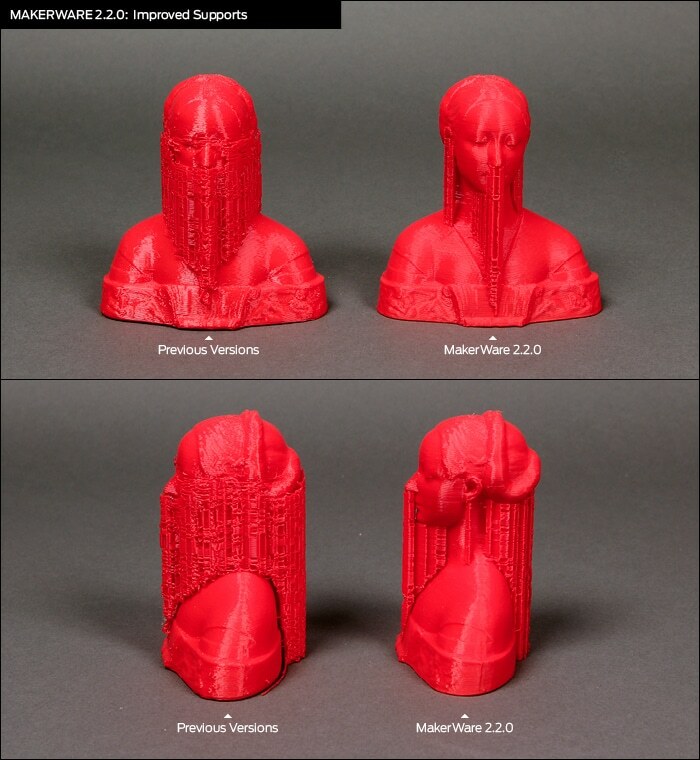 We’d love to see how MakerWare 2.2.0 improves the way you print, so send us your before and after photos and any feedback to thoughts@makerbot.com. Click below to see the full MakerWare and and firmware release notes. There are now separate custom profile templates for high, standard, and low resolution prints. A number of minor print quality bugs have been fixed, including the missing roofs and floors bug. MakerWare can print over USB to MakerBots running Sailfish firmware. Bug fix for the LCD display rolling back to 0 hours when a print time exceeds 10 hours. Z-Pause now resets to ‘off’ after a cancelled print.